Early in the week of November 6, we received a call from an Iraqi friend in the United States. She was concerned for the safety of a 15-year old boy whom she understood had been shot by ISIS militants near Mosul. He had just been getting groceries for his family when he was shot by an ISIS sniper. The bullet had damaged the boy’s spinal column and he was unable to walk or otherwise get to medical care. His location made it very difficult for his family to get him to where medical help was available. “Is this a case you can help with?” our contact asked. The ATP team quickly researched the case and was able to identify the location. Unfortunately, getting there would require passing through up to a dozen Iraqi Army checkpoints. When ISIS was driven out of Mosul, many militant fighters simply blended in with the population, keeping their weapons with them. ISIS snipers are all over Mosul and they frequently take advantage of checkpoints to target people passing through. Further complicating matters, the Mosul Hospital had been used by ISIS as a headquarters during their occupation and had been repeatedly bombed. It had sustained significant damage and as a medical facility, it was useless. Appropriate medical care would have to be found elsewhere and the boy – named Mohammed – would have to be transported further. We were fortunate to have two seasoned and dedicated ATP leaders that volunteered to make the journey and take Mohammed through all the checkpoints to safety. One had to make a dangerous trip from southern Iraq to join the effort. All were able get to the jumping off point with no problems. On the night of November 8 – with two days of preparation – the team set out. At that point, we turned to our incredible network on social media to ask for your prayers. We couldn’t share much information as it could have fallen into the wrong hands. You all responded by sharing your beautiful prayers with the world. There was an astonishing number of comments, prayers, likes and shares on social media. The ATP network really committed itself to the success of the effort. After several hours of travel through the checkpoints, the team located Mohammed and he was loaded into the ambulance. The return trip went smoothly. All checkpoints were cleared and the joy to this part of the story is that it all passed uneventfully. 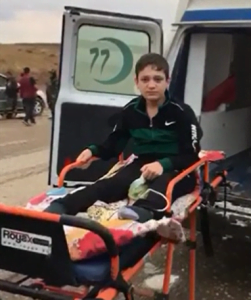 Mohammed was then taken to Erbil where first-rate medical care was provided by the Santa Maria Medical Group. The Santa Maria organization provides care to children and ha s been extremely generous in providing its medical services to those in need. As Mohammed’s father is currently jobless, this was an incredible blessing for the entire family. Mohammed is doing very well and is receiving medical care. He is undergoing physical therapy and has the chance of regaining use of his legs. Mohammed’s family is with him now as well in a house provided by your generosity to ATP. He is still fighting against some intestinal issues but with the great doctors serving him, he has a very bright future. You were a huge part of the positive ending to this part of Mohammed’s story. Through your prayers, invaluable partnerships and the grace of God, Mohammad and his family have a new lease on life that they may have never before thought possible. Thank you! Mohammed is receiving Physical Therapy to help him regain the use of his legs. Doctors are optimistic that he will one day be able to walk, but it will require extended PT and treatment. Unfortunately, PT treatment will run the family about $1,300 US per month. You can contribute to Mohammed’s recovery by making a donation today. 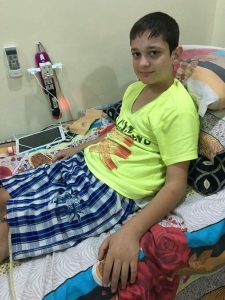 As Mohammed’s father is looking to find work, your contribution would be wonderfully helpful in securing a bright future for a young man so badly injured. Just click the make a contribution link here and specify your gift to Mohammed’s Physical Therapy in the “Additional Information” field. Want more Stories from the field or news from ATP? Just sign up on our email list and we will bring the stories to you!